Heading into 2015, the plan for ATPW is to review as many televised championship matches as possible, whether that be WWE, TNA or elsewhere, whilst including a full review of the show in which the title match takes place to add context to the importance of said title match. I thought I'd kick things of early, with this review of WWE's Super Smackdown Live, which aired as part of WWE week on the USA Network on Tuesday 16th December 2014 and included Naomi challenging Nikki Bella for the Diva's Championship. Sounds like a blast, eh? This match was originally advertised as being Seth Rollins taking on Ryback, which I was genuinelly intrigued to see. I was interested to see if Rollins had the skill to put together a decent match with Ryback, who isn't particularly known for his technical prowess, but has had passable matches with guys like Daniel Bryan and Sheamus. However, at the top of the second hour, Rusev attacked Ryback, sambo superkicking him off the stage and then over some conveniently placed boxes. This feud seems to be heating up nicely, but I'm not sure I actually want to see Ryback vs. Rusev. It's going to take some creative booking to make the match worth watching when it does go ahead. With Rollins already in the ring with his pals Jamie Noble and Joey Mercury by his side, the Money in the Bank contract holder cut a whiny promo that suited the character down to the ground. Whilst also throwing in things like believing he beat John Cena on his own the previous night on Raw, before agreeing that he did, indeed, deserve a night off. This built well to Rollins being interupted by Intercontinental Champion Dolph Ziggler, with the two having some enjoyable back and forth on the microphone, before Rollins agreed to face Ziggler in the main event of the show. It felt like the two had a lot of chemistry on the mic and I couldn't help but wonder why these two haven't been placed in a long-term singles feud yet. Following an interview with Renee Young, in which Rollins went over his on-going feud with John Cena, whilst touching on the Ziggler match, it was time for the main event. This match only cemeted the fact that these two guys should've been placed opposite each other in a long-term and meaningful feud at some point. This was a great TV main event, with an enjoyable story that saw Ziggler fighting from underneath, thanks to the involvement of J&J Security on the outside, whilst Ziggler's comeback attempts would be focused on Rollins injured ribs, which Rollins sold well. The two have clear chemistry in the ring and put together some crisp sequences, like a sequence seeing Ziggler attempting to hit a Jumping DDT, that saw Rollins initially block and attempt a Roundhouse Kick, only for Ziggler to hit the Jumping DDT for two. The closing sequence managed to satisfy one of the matches on-going storylines as J&J Security were kicked out by the referee for interfering in the match, with Ziggler using the opportunity to hit a Zig Zag and pick up the pinfall victory. I was a little disapointed to not see the rib injury play into the closing stages, as it seemed to be forgotten about towards the end of the bout. However, this was still an enjoyable television main event and a solid story that was told soundly throughout the second hour of the show, keeping my attention and giving me a reason to keep watching the rest of the show! 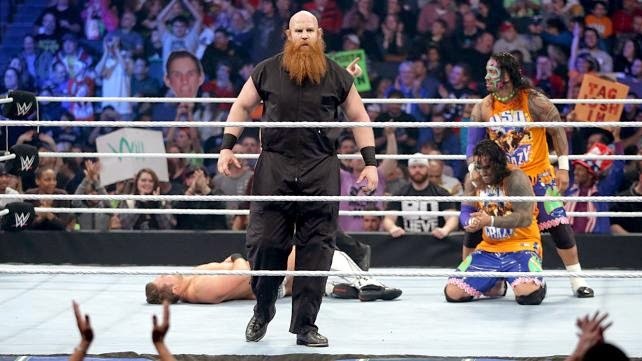 The Miz and Damien Mizdow's feud with The Usos continued as the two teams were joined by a former member of the Wyatt Family in Luke Harper and Erick Rowan respectively. It seemed a strange decision to have Rowan in this match considering he had lost clean to Kane earlier in the night on Main Event. There was no particular need to have Rowan wrestle twice in one night (especially after jobbing to Kane), and another wrestler could've benefitted from this slot. If Rowan was needed for this match, why not have someone else job to Kane on Main Event? Usually this wouldn't be a problem, as the shows airs three days apart, but with Smackdown airing directly after Main Event, this made the booking feel a little bit rushed. The match itself however was a fun six man tag team match, with each element of the match being implemented in a way which played to their skillset. For example, Luke Harper spent the majority of the match in control of an Uso, with The Miz tagging in when Harper was fully in control and Mizdow dicking around on the outside. Whilst I'm tiring slightly of Mizdow's antics, this match allowed his relationship with The Miz to be spotlighted nicely, with Miz often refusing to tag in his partner and the two almost coming to blows when Mizdow started mimmicking Harper which was a nice touch. There was also a well done sequence that saw Mizdow tag himself in on Harper, only for Miz to do exactly the same to Mizdow, almost immediately. All these antics kept me entertained to a degree, but it was the finish of the match that bought this match together. Rowan was used very well here, as he battered Miz for a few minutes, with a series of explosive powers moves, including a Full Nelson Slam for a near fall, before the Usos twatted Harper and Miz with superkick, and hit stereo suicide dives on Harper and Mizdow, before encouraging Rowan to head to the top rope to hit a big splash and pick up the win. It was an exciting finish that allowed both The Usos and Rowan to look good in their own way, whilst opening doors for some other interesting storylines going forward. My main concern coming out of the match, continued to be Erick Rowan. That may sound strange considering I praised how "Big Red" was used here, but I'm still not sure if Rowan is ready for a singles push and neither is WWE apparently considering the even steven booking they gave him on Tuesday night. He looked comfortable in a six man here, but it would be weird if he didn't considering he's spent the majority of his WWE career working in six man's as part of The Wyatt Family, alongside experienced guys like Seth Rollins, Dean Ambrose and Luke Harper, and was helped a lot by The Usos who know how to connect with the audience, I'd like to see more of that from Rowan himself going forward. Divas! This match was tied into the previous one, as Miz's feud with Jimmy Uso continued, as Miz somehow got Jimmy's wife Naomi a title shot. I'm not quite sure how that works because apparently no one is in charge, but we'll quickly skip over that. Before the bout, Naomi was seen backstage with Jimmy, as Jimmy gave some kind of generic pep talk to his wife, who revealed she didn't want him at ringside. This felt a little superfluous as I don't remember ever seeing Jimmy at ringside with Naomi or vice-versa, but hey, at least this match was getting a little bit of build. I was incredibly surprised with this match, as it held my attention, and didn't once look awkward or botchy. I enjoyed seeing Nikki Bella going for the pin after every move she hit, which all looked, at least, decent, including a well done slingshot suplex. Naomi's offence all looked good, and different to what a lot of her contemparies are doing, like a Stunner on the apron using the top rope. The storyline elements of The Miz and Jimmy Usos involvement costing Naomi the match worked nicely and moved their feud forward, whilst Jimmy and Naomi's relationship was also thrown into the spotlight. It didn't set the world a light, but it didn't stink out the place either, which when it comes to Diva's matches on the main roster is always a bonus. Roman Reigns made a return to in-ring action, ending his mini-feud with Fandango in a sub-five minute squash match. Maybe extended squash match would be a fairer term, as Fandango did get some offence in (mainly headlocks and such), before Reigns made his comeback and hitting a number of his signature moves, including the Superman Punch and Spear, en route to picking up the victory. Fandango did a good job of bumping for Reigns and allowing him to look like a star, whilst Reigns still seems to be over with the fans recieveing "Roman Reigns" and "Let's Go Roman" chants whilst trapped in Fandango lengthy headlock. Reigns looked good and that was the purpose of the match, so there's no complaints from me here. 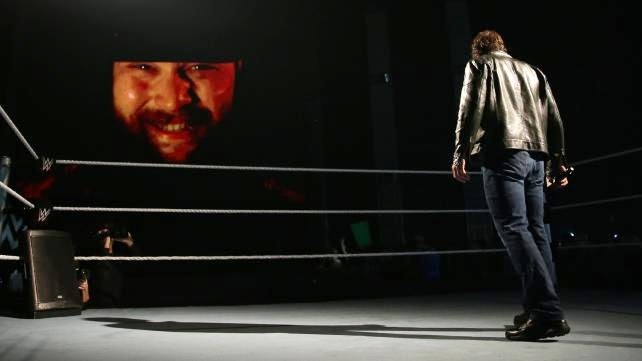 The Dean Ambrose and Bray Wyatt feud continued as the pair engaged in a war of words, seemingly to promote their Boot Camp match on the following nights Tribute to the Troops. Ambrose's delivery of his promo felt fresh, as he allowed all the important information to settle in with the fans in the arena and at home, whilst still remaining completely captivating to watch on screen. With Wyatt interupting, to reveal he was "enjoying this so much", similar to Ambrose, Wyatt's delivery makes him captivating to watch, but I'm begining to believe his promos are more style than substance, as whilst I couldn't take my eyes of the screen, I have no idea what he was trying to get over here. This match was entirely pointless. Kane had already destroyed Rose on Raw and defeated Erick Rowan on Main Event, and I'd imagine anyone watching was aware of what Kane can do in the ring, because he's been around for almost TWENTY YEARS! I'm not sure what him destroying Rose and Tombstone Piledriving "The Bunny" was supposed to achieve going forward. It had been a long time since I'd watch Smackdown and I have to say I was impressed with this episode. Two hours works so much better than the three hour long Raw, from a viewers perspective, at least. Ziggler and Rollins did a great job of their main event, with the build up throughout the second hour of the show aiding the match nicely. Everything else (with the exception of Kane vs. Rose) was at least passable, with the Six Man Tag bout standing out amongst the rest of the card. Maybe, it was because this was the special live episode, but I'm hoping to see more of this level of show heading toward the Royal Rumble.